The demand for non-invasive diagnostic imaging in cardiology increases with the advancing age of the population. Whilst exercise testing and myocardial perfusion scintigraphy have provided non-invasive functional assessment of coronary artery disease there has been little alternative to invasive coronary angiography for anatomical assessment of the coronary tree. In recent years technological advances have enabled improvements in both temporal and spatial resolution such that multi-detector computed tomography (MDCT) is now able to reproducibly evaluate cardiac disease. The combination of this improved resolution with more advanced post-processing techniques now means that MDCT has the ability to perform both anatomical and functional assessment from the single study. This technique therefore not only provides a non-invasive alternative to conventional angiography but the same data-set allows concurrent assessment of cardiac function, assessment of aberrant vessels, graft patency studies and assessment of the coronary artery wall. Cardiac computed tomography (CT) has the potential to provide a much more complete assessment than conventional coronary angiography. It is likely to become the non-invasive imaging modality of choice to exclude significant coronary artery disease in those with intermediate risk of coronary artery disease. This second part of a two-part article considers the clinical applications and clinical future developments for cardiac CT. The first part considered ECG-gated image reconstruction, image resolution, radiation dose, and post-processing protocols and limitations. 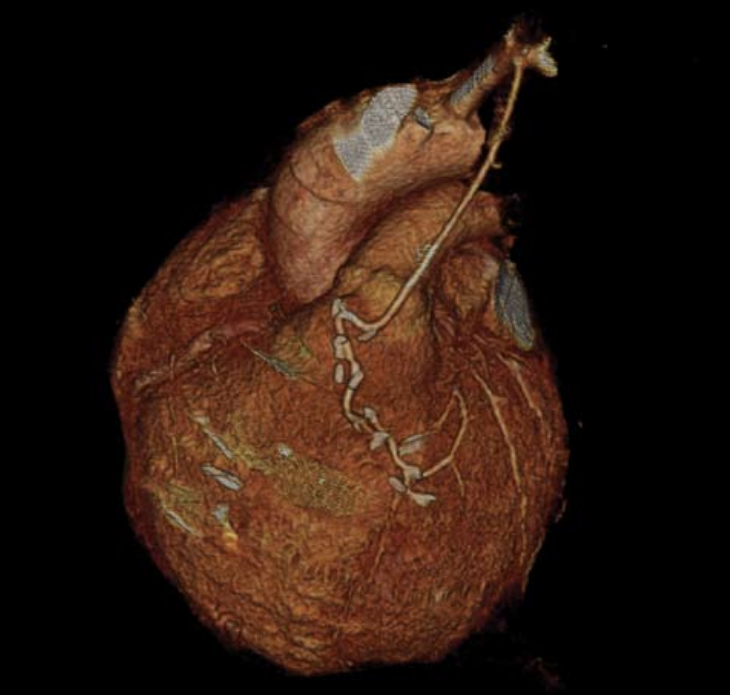 Recent advances in computed tomography (CT) processing technology have focused mainly on multi-detector computed tomography (MDCT) coronary angiography and there has been a rapid evolution from the research setting into clinical practice. The quality and quantity of the ‘raw’ dataset acquired for each scan allows assessment of anatomy, cardiac function, ventricular mass and volume,2 valvular stenosis assessment3 and identification of areas of fixed hypoperfusion.4 It can therefore offer information above and beyond that of alternative techniques such as the pure lumenography and ventriculography of invasive coronary angiography (ICA). Whilst cardiac magnetic resonance imaging (CMR) remains the cardiac modality of choice for the assessment of many of these functional parameters, it still lacks the ability to routinely assess the coronary tree. CT can provide clear delineation of the entire coronary tree including assessment of the vessel wall. With functional assessment it offers a one-test assessment e.g. prior to a valve replacement in a 60-year-old patient who has a low to intermediate risk of coronary artery disease or, alternatively, in a patient with congenital valvular stenosis who may also have aberrant coronary arteries. Contrast flow is dependant not only on the size and position of the intravenous cannula but also on the underlying cardiac output. During the actual angiogram the patient receives breath hold instructions followed by 70 ml of contrast injected at 4–5 ml per second through a 20-gauge venflon in the antecubital fossa. To achieve adequate contrast delivery speed a double-headed power injector is employed. This initial contrast bolus is immediately followed by a smaller (40–50 ml) pure saline chaser or 50:50 contrast and saline mix to optimise image quality and contrast enhancement throughout the entire coronary tree, push contrast out of the arm veins and to minimise beam attenuation from the excessively dense contrast in the right heart and superior vena cava.16 After the necessary time delay the scan commences and covers the 12–14 cm cranio-caudal scan in a single breath hold of 8–12 seconds on a 64-channel system. Older four- and 16-channel CT systems require significantly longer patient breath holds. As previously outlined, there are several other factors that must also be optimised prior to scanning for the best chance of clear and diagnostic images. These include a suitable heart rate (50–70 bpm) which may require the use of negative chronotropes as necessary; a regular cardiac rhythm (although anecdotal evidence would suggest that rate-controlled atrial fibrillation does allow for reasonable image quality); no or low coronary calcium burden and no respiratory or patient movement. Very large patients also cause significant degradation of image quality. MDCT angiography has been compared with ICA at each stage of development. Four-slice MDCT images were not of suitable quality to elucidate stenoses in smaller vessels and had a reported sensitivity of 92–95% and specificity of 86–93%.17,18 These values improved with 16-detector machines19 and the most recent 64-detector data suggest a sensitivity of 99% and specificity of 95% with a negative predictive value of 99% and positive predictive value of 76% in technically adequate studies.20 MDCT coronary angiography has therefore improved significantly with advances in technology but still has a tendency to overestimate coronary artery stenoses (particularly if calcified). It is clear that the major strength of CT coronary angiography (CTCA) lies in its ability to exclude significant coronary artery disease, reflected in the high negative predictive values reported in the majority of studies.21 It is now an accepted alternative in the diagnostic assessment of coronary artery disease. Table 1 gives the indications and contra-indications for this technique. those in whom an alternative to myocardial perfusion scintigraphy (MPS) is sought. MDCT should not be carried out on patients with a high risk of coronary artery disease since ICA can and should lead seamlessly into immediate intervention in this group. Coronary stents are easily visualised on both contrast-enhanced and non-enhanced CT images due to their high density (figure 1).12 Unfortunately due to their high density, stents produce similar problems to heavily calcified vessels with over projection of high density into the lumen of the vessel making assessment of in-stent restenosis from neo-intimal proliferation problematic even with the 64-detector scanners.22 Some manufacturers have provided dedicated reconstruction algorithms in an attempt to surmount this difficulty. Total occlusion or severe stenosis is generally detectable by MDCT angiography. Stents with thinner struts are more assessable due to their lower overall density23 but MDCT angiography remains of limited usefulness in quantitative assessment of non-significant in-stent restenosis imaging and is only reliable in stents with a diameter in excess of 4 mm.12 Currently MDCT angiography is of benefit in assessment and follow up of left main stem stents but has only moderate sensitivity in other, smaller vessels.24 As with diagnostic MDCT angiography, there is a high negative predictive value and MDCT may be best employed as a gatekeeper to further invasive angiographic investigation. In contrast to the technical difficulties of stent assessment, graft patency assessment lends itself well to MDCT angiography due to the large diameter, limited calcification and relative immobility of grafts (figure 2). Limitations include artefacts secondary to metallic clips, sutures, surgical markers and the proximity of grafts to sternal wires. Up to 10% of vein grafts may become occluded within the peri-operative period25 rising to 25% at five years and 59% at 10 years. Arterial graft occlusion rises to 17% in the same 10-year period.26 MDCT has been shown to be both highly sensitive and specific in assessment of coronary artery grafts with sensitivities between 95% and 100% and specificity of 94 and 100%.27,28 Given the technical difficulty of graft location during ICA, MDCT has been validated as a robust clinical alternative. A full assessment, however, must also look at the native vessels and this can be more problematic due to the likelihood of severe and diffuse disease with the inherent likelihood of severe calcification. One of the major potential advantages of MDCT coronary angiography over conventional ICA is the ability to identify not only calcified lesions but also the various other components that make up so-called ‘soft’ plaques. There is a difference in attenuation between lipid, fibrous and calcified material and this allows not only differentiation of soft plaque from calcified plaques but allows some assessment of plaque composition.29 There has been considerable interest in soft plaques as these may represent high-risk plaques with a higher tendency to rupture.30 It has been shown that in patients presenting with acute coronary syndrome there is a higher prevalence of soft plaque and vascular remodelling identified on MDCT compared to a similar population with stable angina pectoris.31 Soft plaques can also be assessed via intravascular ultrasound (IVUS) but this is expensive and invasive. MDCT has been shown to correlate well with IVUS.32 It is not possible to give absolute figures for these composites of plaques since data suggest that the higher the intra-luminal density of the contrast, the higher the soft plaque density surrounding it33 and further research is required on the interaction of these two factors before these subtle distinctions can be reliably incorporated into clinical practice. Data obtained during the MDCT coronary scan can also be used to derive left and right ventricular function. Reconstruction of the datasets at multiple phases of the cardiac cycle (usually every 5% or 10%) allows calculation of both end-diastolic and end-systolic volumes of the left ventricle and therefore stroke volume, cardiac output and ejection fraction. Left ventricular volumes can be reconstructed at these phases using dedicated software. With some interaction, left ventricular wall motion, thickening and thickness can also be derived.34 There is good correlation between MDCT, CMR1 and trans-thoracic echocardiography (TTE)34 for ejection fraction. Regional wall abnormality assessment is less favourable when compared to TTE due the lower temporal resolution of MDCT. There is a good correlation between the two techniques for akinetic, dyskinetic and normal segments but only a moderate correlation in the assessment of hypokinetic segments.34 The fact that many patients are also treated with negatively chronotropic agents to facilitate their MDCT angiogram may also impact on their overall cardiac function. Right ventricular function is more difficult to assess due to its complex geometry, but initial preliminary data suggest a good correlation with CMR.35 This functional information comes for ‘free’ with the MDCT angiographic dataset. It can be seen that recent advances in MDCT technology have facilitated a rapid emergence of cardiac MDCT into mainstream cardiological practice. It is likely that MDCT angiography will become an increasingly utilised tool in the diagnosis of coronary artery disease, relieving the burden on nuclear medicine and reducing the number of day-case diagnostic angiograms. It has already been utilised in Emergency Rooms both in the USA36 and Israel37 to exclude significant coronary disease and/or pulmonary embolus and dissection (triple rule-out) in patients presenting with acute chest pain. This trend is likely to continue. Functional analysis is likely to become routinely incorporated into MDCT angiographic reports and will continue to be utilised in patients with contraindications to CMR. Valve assessment by MDCT has been validated in research with good correlation of aortic valve stenosis with TTE3 and transoesophageal echocardiography38 although MDCT data are likely to remain inferior to CMR for the foreseeable future due to the limited temporal resolution of MDCT and the benefit of additional flow data available on CMR. MDCT perfusion imaging is currently under intense investigation and whilst fixed hypoperfusion following acute myocardial infarction has been demonstrated and correlates well with CMR,4 its clinical usefulness remains to be seen. Dynamic perfusion protocols similar to those used in MPS scanning have also been developed and show a good correlation with MPS.39 This involves two scans, one at rest and one during stress, both involving a significant radiation dose and until this dose issue is resolved, MDCT is unlikely to challenge MPS in clinical cardiology. Efforts continue to minimise radiation.40 Many of the technological hindrances that currently limit the clinical utilisation of cardiac MDCT are also likely to be overcome in the forseeable future. Cardiac CT provides a much more complete cardiac assessment than pure coronary imaging. It provides morphological data comparable with CMR, functional data comparable with echocardiography and the potential for perfusion data comparable with MPS, which all highlight the versatility of cardiac MDCT. Optimal patient selection and preparation is currently the key to high quality imaging. The radiation dose, whilst not irrelevant, must be put in the context of overall lifetime cancer risk and also of the dose from alternative imaging techniques. It is important to acknowledge the reduction in morbidity and mortality from MDCT as compared with ICA when comparing the overall risk between techniques. Patient choice will influence the speed of uptake of cardiac MDCT, but the technique has come of age. The idea of a ‘one-stop shop’ for cardiac assessment is attractive and these are exciting times in the world of non-invasive cardiac imaging. The first part of this article which considered ECG-gated image reconstruction, image resolution, radiation dose, and post-processing protocols and limitations was covered in the last issue of the journal (Br J Cardiol 2007:14:143–50). Jeurgens KU, Grude M, Maintz D et al. Multi-detector row CT of left ventricular function with dedicated analysis software versus MR Imaging: Initial experience. Radiology 2004;203:403–10. Dirksen MS, Bax JJ, de Roos A et al. Usefulness of dynamic multi-slice computed tomography of left ventricular function in unstable angina pectoris and comparison with echocardiography. Am J Cardiol 2002;90:1157–60. Poueler A-C, le Poulain de Waroux J-B, Pasquet A, Vanoverschelde J-L, Gerber B. Multidetector row computed tomography accurately estimates aortic valve area as compared to transthoracic and transesophageal echocardiography. Circulation 2005;112:II–466. Niemen K, Cury R, Nomura CH et al. Contrast-enhanced 64-slice MDCT of acute myocardial infarction – a segmental comparison with MRI. Circulation 2005;112:II–467. Agatston AS, Janowitz WR, Hildner FJ, Zusmer NR, Viamonte M Jr, Detrano R. Quantification of coronary artery calcium using ultrafast computed tomography. J Am Coll Cardiol 1990;5:827–32. Hoff JA, Chomka EV, Krainik AJ, Daviglus M, Rich S, Kondos GT. Age and gender distributions of coronary artery calcium detected by electron beam tomography in 35,246 patients. Am J Cardiol 2001;87:1335–9. Flohr TG, Schoepf UJ, Keuttner A et al. Advances in cardiac imaging with 16-section CT systems. Acad Radiol 2003;10:386–401. Greenland P, Abrams J, Aurigemma GP et al. Prevention Conference V. Beyond secondary prevention: identifying the high risk patient for primary prevention: non-invasive tests of atherosclerotic burden:Writing Group III. Circulation 2000;101:E16–22. Ohnesorge B, Flohr T, Becker C et al. Cardiac imaging by means of electrocardiographically gated multisection spiral CT: initial experience. Radiology 2000;217:564–71. Mollet NR, Cademartiri F, Niemen K. Multislice spiral computed tomography coronary angiography in patients with stable angina pectoris. J Am Coll Cardiol 2004;43:2265–70. J de Feyter P, Krestin GP. Computed tomography of the coronary arteries. London: Taylor & Francis,2005: 8–11. Morgan-Hughes GJ, Roobottam CA, Owens PE, Marshall AJ. Highly accurate coronary angiography using sub-millimetre computed tomography. Heart 2005;91:308–13. Kuettener A, Trabold T, Schroeder S et al. Noninvasive detection of coronary lesions using 16-detector multislice spiral computed tomography technology:initial clinical results. J Am Coll Cardiol 2004;44:1230–7. Cademartiri F, Nieman K, Raaijmakers R et al. IV contrast administration on a 16-multidetector row helical CT scanner: test bolus vs bolus tracking. Radiology 2004;233:817–23. Cademartiri F, Nieman K, Raaijmakers R et al. Computed tomography coronary angiography: usefulness of saline chaser. Eur Radiol 2004;14:178–83. Ropers D, Baum U, Pohle K et al. Detection of coronary artery stenoses with thin-slice multi-detector row spiral computed tomography and multiplanar reconstruction. Circulation 2003;107:664–6. Nieman K, Cademartiri F, Lemos PA, Raaijmakers R, Pattynama PM, de Feyter PJ. Reliable non-invasive coronary angiography with fast sub-millimetre multislice spiral computed tomography. Circulation 2002;106:2051–4. Hoffman MHK, Shi H, Schmitz B et al. Noninvasive coronary angiography with multislice computed tomography. JAMA 2005;293:2471–8. Mollet NR, Cademartiri F, van Mieghem CA et al. High-resolution spiral computed tomography coronary angiography in patients referred for diagnostic conventional coronary angiography. Circulation 2005;112:2318–23. Becker CR. Coronary CT angiography in symptomatic patients. Eur Radiol 2005;15 (S2):B33–41. Seifarth H, Ozgun M, Raupach R et al. 64-versus 16-slice CT angiography for coronary artery assessment: in vitro experience. Invest Radiol 2006;41:22–7. Niemen K, Cademartiri F, Raaijmakers R, Pattynama P, de Feyter PJ. Non-invasive angiographic evaluation of coronary stents with multi-slice spiral computed tomography. Herz 2003;28:136–42. Gaspar T, Halon DA, Lewis BS et al. Diagnosis of in-stent restenosis with multidetector row spiral computed tomography. J Am Coll Cardiol 2005;18:1573–9. Bryan AJ, Angelini GD. The biology of saphenous vein occlusion: etiology and strategies for prevention. Curr Opin Cardiol 1994;9:641–9. Fitzgibbon GM, Kafka HP, Leach AJ, Keon WJ, Hooper GD, Burton JR. Coronary bypass graft fate of 5,065 grafts related to survival and reoperation in 1,388 patients during 25 years. J Am Coll Cardiol 1996;28:616–26. Ropers D, Ulzheimer S, Wenkel E et al. Investigation of aortocoronary bypass grafts by multislice spiral computed tomography with electrocardiographic-gated images. Am J Cardiol 2001;88:792–5. Niemen K, Pattynama PN, Rensing BJ, Van Geuns RJ, De Feyer PJ. Evaluation of patients after coronary artery bypass surgery:CT angiographic assessments of grafts and coronary arteries. Radiology 2003;229:749–56. Schroeder S, Kopp AF, Baumbach A et al. Noninvasive detection and evaluation of coronary plaques with multislice computed tomography. J Am Coll Cardiol 2001;37:1430–5. Varnava AM, Mills PG, Davies MJ. Relationship between coronary artery remodelling and plaque vunerability. Circulation 2002;105:939–43. Motoyama S, Kondo T, Anno H et al. Multi-slice CT characteristics of vulnerable coronary lesions. Circulation 2005;112:II–728. Bruining R, Cademartiri F, Runza G, Mollet N, J de Feyter P, Hamers P. A software prototype for quantitative computed tomography coronary angiography (QMCTA): an in-vivo validation study with intracoronary ultrasound as reference. Circulation 2005;112:II–728. Cademartiri F, Mollet NR, Guillermo R et al. Influence of intracoronary attenuation on coronary plaque measurements using multislice computed tomography: observations in a ex-vivo model of coronary CT angiography. Eur Radiol 2005;15:1426–31. Lembecke A, Dohmen PM, Dewey M et al. Multislice computed tomography for preoperative evaluation of right ventricular volumes and function: comparison with magnetic resonance imaging. Ann Thorac Surg 2005;79:1344–51. Hoffman U, Nagurney TJ, Pena AJ et al. MDCT in early triage of patients with acute chest pain – a comparison to standard care. Circulation 2005;112:II–680. Rubinshtien R, Halon DA, Gaspar T et al. Triage and management of patients presenting to the emergency room with chest pain of uncertain aetiology using 64-slice CT. Circulation 2005;112:II–680. Baumert B, Plass A, Bettex D et al. Dynamic cine mode imaging of the normal aortic valve using 16-channel multi-detector row computed tomography. Invest Radiol 2005;40:637–47. Kurata A, Mochizuki T, Koyama Y et al. Myocardial perfusion imaging using adenosine triphosphate stress multi-slice spiral computed tomography. Circulation 2005;69:550–7. Hesse B, Murphy RT, Greenberg N, Garcia M. Reducing the effective radiation dose in cardiac multi-detector computed tomographic angiography: utility of tissue Doppler imaging guided tube current modulation. Circulation 2005;112:II–559.